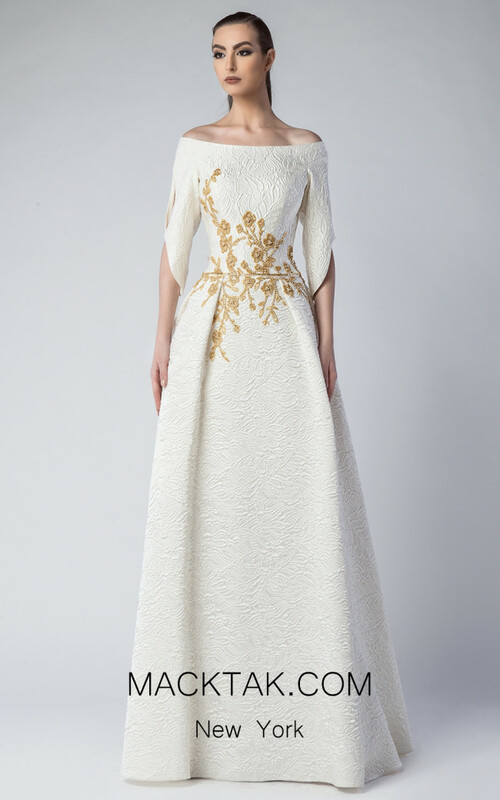 Divine brocade embroidered evening gown by Edward Arsouni Couture. Captivate all in this glamorous evening gown by Edward Arsouni Couture. Let out your inner queen in this radiant off the shoulder elbow length sleeves. Dazzle elegantly with this delicate floral embroidery around the waistline. Take a spin as if you are on the runway with your beautiful immaculate full length hem. Wear Edward Arsouni to any one of your special occasions and be the center of attention. MackTak collections of evening dresses are the most exquisite and favorable dresses you will see. Let MackTak help you choose the perfect dress for you so everyone will be left restless to know who you are wearing and where you purchased it from, while making this event become one of your most memorable experiences.